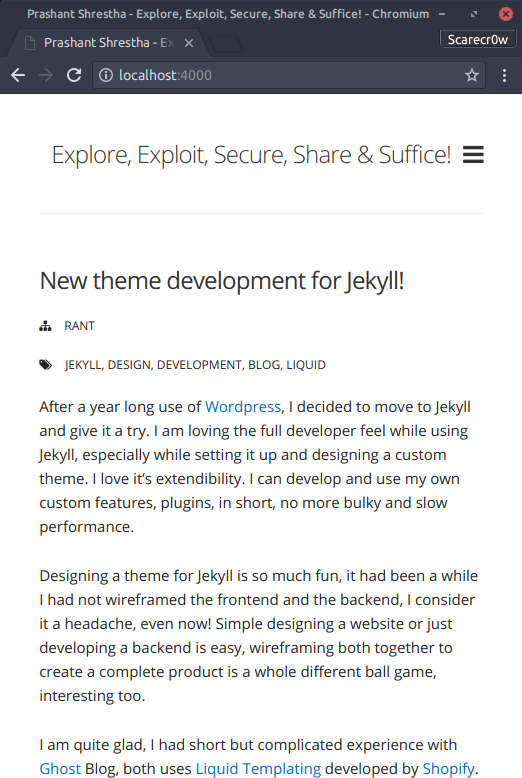 After a year long use of Wordpress, I decided to move to Jekyll and give it a try. 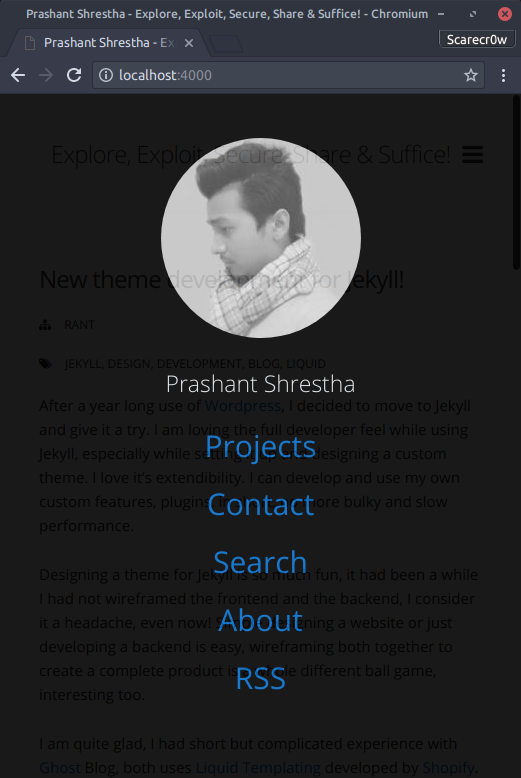 I am loving the full developer feel while using Jekyll, especially while setting it up and designing a custom theme. I love it’s extendibility. I can develop and use my own custom features, plugins, in short, no more bulky and slow performance. 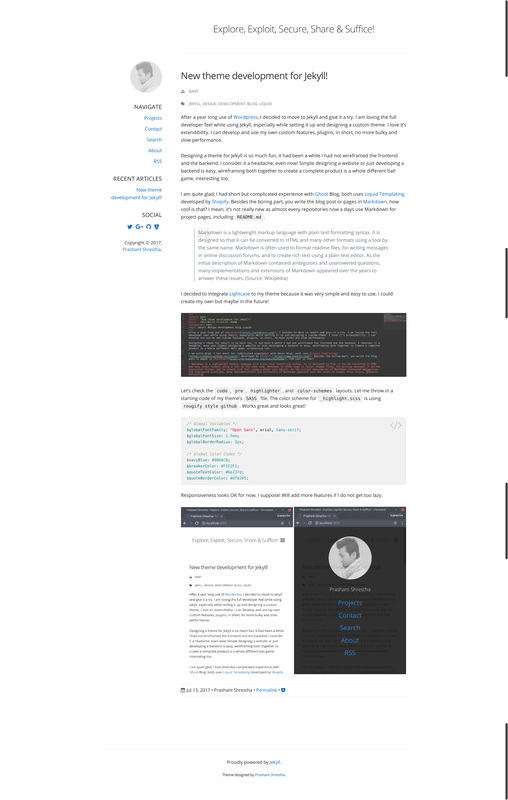 Designing a theme for Jekyll is so much fun, it had been a while I had not wireframed the frontend and the backend, I consider it a headache, even now! Simple designing a website or just developing a backend is easy, wireframing both together to create a complete product is a whole different ball game, interesting too. I am quite glad, I had short but complicated experience with Ghost Blog, both uses Liquid Templating developed by Shopify. Besides the boring part, you write the blog post or pages in Markdown, how cool is that? I mean, it’s not really new as almost every repositories now a days use Markdown for project pages, including README.md. 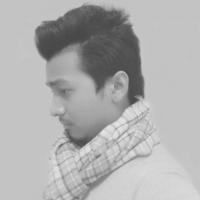 Markdown is a lightweight markup language with plain text formatting syntax. It is designed so that it can be converted to HTML and many other formats using a tool by the same name. Markdown is often used to format readme files, for writing messages in online discussion forums, and to create rich text using a plain text editor. As the initial description of Markdown contained ambiguities and unanswered questions, many implementations and extensions of Markdown appeared over the years to answer these issues. (Source: Wikipedia) I decided to integrate Lightcase to my theme because it was very simple and easy to use, I could create my own but maybe in the future! Let’s check the code, pre, highlighter, and color-schemes layouts. Let me throw in a starting code of my theme’s SASS file. The color scheme for _highlight.scss is using rougify style github. Works great and looks great! Responsiveness looks OK for now, I suppose! Will add more features if I do not get too lazy. I achieved what I wanted in a blog - simple, minimal, professional yet light. The theme is still under development therefore you might reach 127.0.0.1 quite often while surfing around!